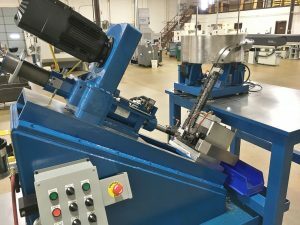 Self Feeding Tapping Units Archives | Hypneumat, Inc.
Hypneumat recently built this slant bed tapping machine equipped with a LS36E Lead Screw tapper and Vibra-Flight vibratory bowl and part feeding magazine. This machine will tap a 1/4-28 thread with unattended operation. Full electrical and pneumatic controls, quick change floating tool holder and coolant pump were included. No. You're not seeing double. No, you’re not seeing double. 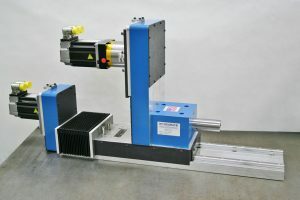 This 2 machine project was for a current customer in Mexico. 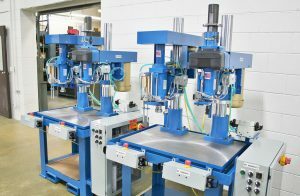 Each drilling and tapping machine has an automatic DQ46EHB drilling unit and LS36E lead screw tapping unit, with controls and is ready for the customer’s part holding fixtures.